Explore your artistic side through the extremely illuminating practice of writing. Connecting with your voice via journaling provides mental, emotional and physiological benefits. Please join us for this unique and very special workshop on the evening of Thursday, August 23rd led by Laura Rubin, founder of AllSwell Creative. Laura believes everyone has a creative voice, regardless or whether you’re an artist or not. Rubin will walk us through accessible writing-based exercises to help foster or deepen a consistent journaling practice. We all need inspiration and Laura provides just that! To keep the vibes high, Laura has curateds a selection of ecstatic literature from the greats, such as Dickinson and Whitman, to serve as touch points throughout the process. You don’t need to have any background in writing or literature to enjoy these experiences. The mere act of putting pen to paper is transformative. There’s no wrong way to do this. As Papa (a.k.a. Hemingway) said: write drunk, edit sober. We’re not suggesting you follow his example, but the point is to embrace the process and give yourself permission to start somewhere. The activity itself has value. The therapeutic benefit of doing it is the reason why it should be done. AllSwell started as a passion project launched by Laura Rubin to encourage creativity in all its forms. Laura is the founder and creative director of the communications agency Left Left Right (LLR) Consulting. 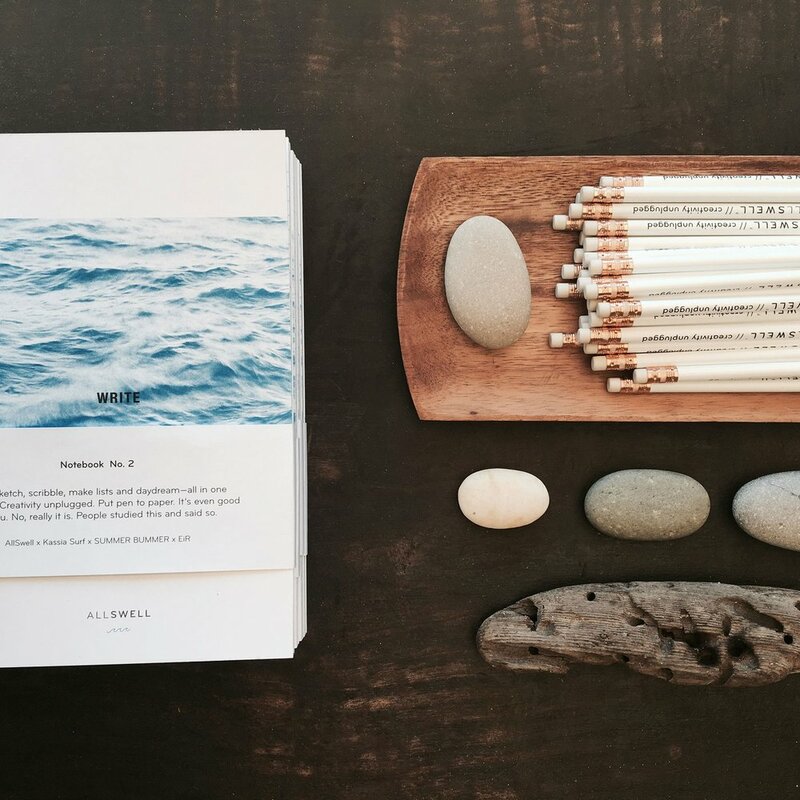 Born from a morning surf check with uninspiring results, Laura decided to sit on the beach and journal instead. “Swell or no swell, all’s well.” As an inveterate scribbler and journal-keeper, she wanted to invite more people, like you, to reap its benefits. Since Laura likes to both write and draw, she was on the lookout for one lightweight notebook that offered both lined and unlined paper for tossing in a beach bag or backpack. She couldn’t find any so she made some; they sold out. So, she made some more. And those sold out. People liked these notebooks. Moreover they were hungry for analog creative experiences, ways to express themselves. What started as a bit of a whim, fulfilling a personal need, AllSwell is now much more. It’s about waking people up to the fact that their life is a creative act. It really is. What does that mean? You get to choose what it looks like. How’s that for daunting + exciting? Pretty good stuff.